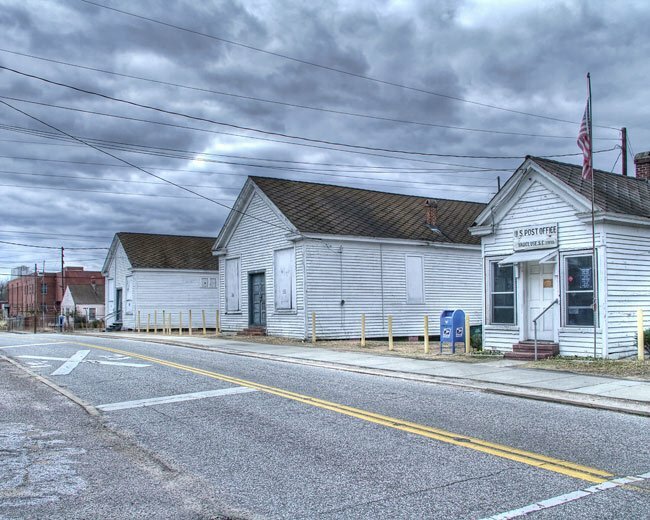 This post office, located in the unincorporated Aiken County community of Vaucluse (pronounced “VOH • cloos”), was established in 1904 to serve employees of the Vaucluse Mill. The former textile mill (comprised of brick and shown in the background) began production in 1830. It was designed by the architectural firm of Lockwood and Greene, which would later go on to design roughly 50 other mill facilities in South Carolina. Several other buildings and over 80 residences were added over the decades, and together they form the oldest mill complex in our state. One of the mill’s founders, William Gregg, used the Vaucluse Mill as a springboard to develop his prosperous Graniteville Mill. Though Gregg – often considered to be the father of the southern textile industry – deemed the Vaucluse Mill too inefficient to be profitable, the mill continued operation until 1991. Vaucluse historic district includes the Vaucluse mill compound, located in the center of the village; a ca. 1904 three-building commercial complex located just north of the mill compound; a company built swimming pavilion; the 1877 mill dam; the Vaucluse mill pond; and 83 former company dwellings located in parallel rows along five of the villages residential streets that extend in a rough spoke fashion from the mill compound. The general character of the historic district is a combination of industrial, commercial, and residential use. The Vaucluse mill dominates all other structures in the village; the mill compound includes an 1877 boiler house and smokestack, seven brick hose houses, a 1939 office building, and a 1943 employee canteen. The textile mill village at Vaucluse is an excellent example of a southern textile mill village. It is the oldest mill village in the state, with textile production commencing there around 1830. Contextually, it relates to the birth, rise and decline of the textile industry in South Carolina. In addition, Vaucluse represents the social changes brought about by the spread of mill villages in the state, with the development of the mill worker population created by the expansion of the textile industry. Vaucluse was also the site of William Gregg’s first foray into textile production, with many historians considering Gregg to be the father of the textile industry in the South. The 1877 mill building was also one of the earliest efforts of architect Amos Lockwood, whose subsequent firm, Lockwood and Greene, would go on to design 50 textile manufacturing facilities in South Carolina. Lockwood’s factory design at Vaucluse was of the earliest examples of the New England prototype mill to be built in South Carolina. While living in Aiken, I only heard the name pronounced a Vow close. My grandmother Talulah Cluffy Dean Gunter was born in Vaucluse. It would be nice to know more of the French influence. She had black hair/French coloring. The Cluffy could have been Clough. Her mother was an Atkinson. What district was Vaucluse in when it was established in 1830? There was no Aiken District then. I currently have been working at the Vaucluse Post Office for the past 6 months since May 2017 and thoroughly enjoy working there and meeting and getting to know the residents of Vaucluse. It is too bad about some of the old buildings such as the general store and movie theater next door not being renovated and used for future use. I hope that the post office stays open for another 100 years and that I get to work here for the next 15-20 years before I retire – not to mention the beautiful scenery and pond/lake behind the post office. It would be nice if someone would restore the old buildings next to the post office and rent them out for local weddings, family dinners and birthday parties. It is a shame to see them just going to waste. Melinda Mashburn… Yes, there is a cemetery in Vaucluse, SC. I don’t have any clue on the records, though. Just wanted to confirm that it exists. Dates on tombstones… some effaced by time…go back to mid 1800s at least. I have a relative whose death cert says buried at Vaucluse. The undertaker’s name I believe was Couch & Timmerman or some variation thereof. Is there a cemetery in Vaucluse? Would anyone have records from this cemetery? Any info would be greatly appreciated. 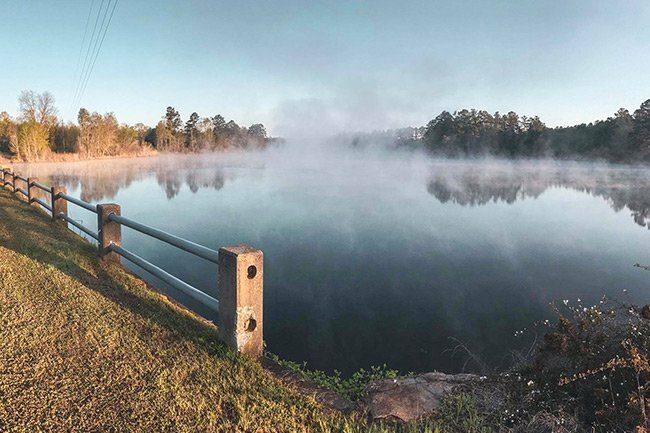 According to Isabel Vandervelde's history of Aiken County, the name comes from the French, a corruption of a phrase that translates to "vale of flowers." The area supposedly reminded the French Hugenot settlers of home. The name is French , I think it means “valley of flowers.” I lived there for most of my childhood life. I’m one of the 32 kids from the 4-classroom school house!! It really was very nice to attend there .. Thank you for sharing this with us, Chris! I spent many of my childhood years in the area. Fond memories learning to swim in Vaucluse Lake and splashing around in the creeks. I’ll never forget years later, while fishing the creek between the mills with my Dad, netting several very sick fish swimming along bank. That moment in time has always remained a clearly disheartening reminder of who and what corporations will sacrifice for monetary gain. Vaucluse is a French reference to an artesian well with its source hidden in a mountain. Does anyone have any pictures of the inside of the theater in Vaucluse and any information as to what it was used for, who performed there, and when? My first job out of college was at Vaucluse Elementary. There were 4 teachers and 32 students in grades 1-6. I taught Math and English and Social Studies to grades 3&4 for one period, then 5&6 for another period. I don't remember anything being there but the little four room school house and never heard how it got it's name. So I'm sorry I took so much time to say no. Where did Vaucluse get it's name?